Royal Caribbean unveils plans for its newest ship. 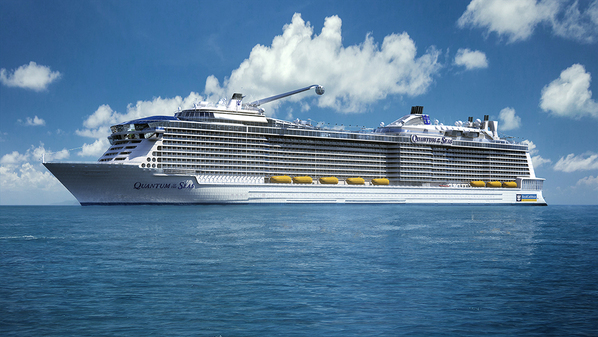 As noted earlier, Royal Caribbean did not reveal everything about Quantum of the Seas at the unveiling event. More will be divulged as the ship is constructed. This was certainly the case with Royal's last class of ships. You cannot explain what Oasis of the Seas or Allure of the Seas is like by saying that they are the world's largest ships and then listing the onboard attractions such as the zip line, the aqua theater, the skating rink, the rock climbing walls, etc. There is also the clever way the people flow is managed, the use of art work to enhance the experience, the quality of the entertainment offerings, the variety of restaurants that appeal to different tastes ranging from hot dogs to high end gourmet dining. All of these things have to be taken into consideration along with how it all fits toegther in order to understand what these ships are all about. Right: Lisa Lutoff-Perlo, Adam Goldstein, Lisa Bauer, Kristen Chenowith, Richard Fain and Harri Kulovaara pose following the presentations made at the Quantum of the Seas unveiling event. Similarly, it appears that Quantum of the Seas will be a multidimensional experience. Some of the dazzling public space features highlighted at the event (e.g., skydiving, bumper cars, roller disco) will be primarily of interest to families and to young active cruisers. However, there were also indications during the presentations and in the materials distributed by RCI that there will be things of interest to the type of sophisticated cruiser who dines at 150 Central Park on Oasis or who cruises on Royal's Radiance class ships. For example, there was mention of the ship having its own Broadway show, guest lecturers, and at least one gourmet dining venue. Thus, Quantum will have things for those who are interested in a relaxed but graceful cruise experience as well as for those looking for an active adventure. In sum, we have been introduced to someone attractive. We do not know her yet but from what we have seen she appears to be exciting and there is reason to anticipate more good things in the future.